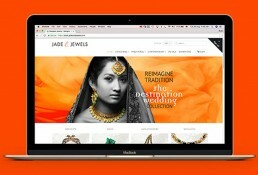 In 2015, Amplify set up an online store for Jade and Jewels (J & J) on the Shopify platform. 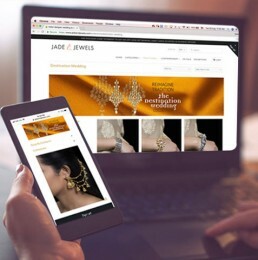 The entrepreneur behind J&J, Annu Lulla, was an early adopter of e-commerce. The chic, semi-precious stone jewellery she designed for J & J targeted the contemporary, globe- trotting Indian woman, comfortable in both sarees and trousers. J&J’s customer persona mirrored Annu’s own sophisticated style sensibilities. Based on these cues, the Amplify designed a sleek and minimalist look for J &J with social media content to match. By early 2018, Annu found that only of 30% of J&J’s customers bought their contemporary jewellery. 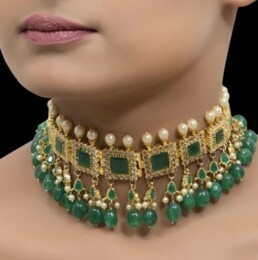 Nearly 70% of J&J’s sales came from affluent South Indian women who preferred traditional Indian jewellery. In response, Annu expanded J & J’s traditional collections to match the preferences of her majority customers. 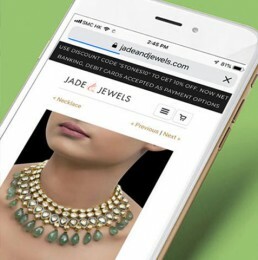 Though most of J & J sales are through pop up stores and exhibitions, their online store is a crucial customer touchpoint. Smart phone penetration in India is growing in leaps and with a corresponding increase in the browsing habits of affluent women . So most customers first get to know of J & J through their mobiles. They go through the collections in detail before deciding whether it’s worthwhile to visit the pop up store. About 70% of those who have access to the internet go online to make informed purchase decisions. Being aware of this, Annu decided that revamping her store was as important as introducing the new jewellery collections. So she approached Amplify again. Amplify chose a rich, ethnic colour palette to replace the cool sophistication of the earlier look. All jewellery was displayed on models, so that customers could visualise how it would look when worn. 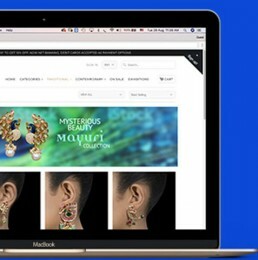 A series of vivid graphics were created to introduce the new collections, with a look and feel that resonated with the affluent South Indian jewellery buyer. How was the launch of the new store communicated? A social media strategy, consisting of e-mailers for those who had opted for marketing communication, Instagram images for eye-candy appeal and Facebook posts for J &J’s existing community of customers was put in place. WhatsApp is already in use for spreading information about upcoming exhibitions. Annu decided to do the social media content herself and underwent some basic online training. What is the learning from this? Recognizing which segment your customers belong to are and altering your products to suit their profiles is vital. Redesigning product websites to cater to this altered customer base, is equally important, since nearly all customers first look for products online before deciding whether to buy online or at a retail outlet. E-commerce platforms like Shopify are constantly innovating and introducing new features. Entrepreneurs have to nimbly take advantage of these new features. It’s not enough to design an online store and sit back. A social media strategy is required, with content framework and posting schedule in place. Interaction with customers has to be on a regular basis. They have to be informed of new product launches, deals and pop up stores. In urban India during long commutes, impulse online shopping driven by attractive discounts takes place. As many as 40% of smartphone purchases are impulse buys. Online and offline marketing work in tandem and have a multiplier effect on sales. A regularly updated and thoughtfully designed website increases the trust your customer has in your brand and your product. So whether you are a large corporate or an single entrepreneur with a dream, investing in an attractive online presence and social media marketing can only work in your favour.